Looking for something a little flash for the upcoming trackday season? MotoGP bikes rarely come up for sale and it used to be the case that some factory machines were returned to Japan to face the crusher, making used examples even rarer than they should be. 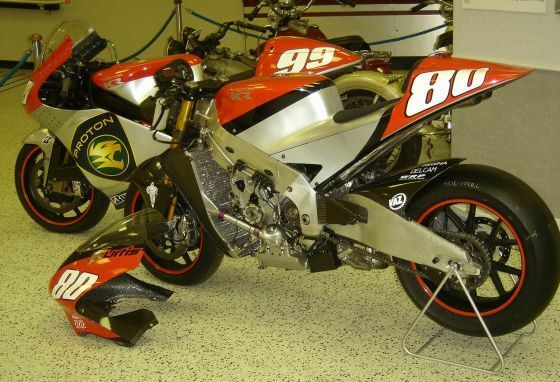 This is the Honda V5 powered Kenny Roberts Proton that was used in the 2004 season in MotoGP. It was the season when Team Roberts went away from using their own three cylinder engine, deciding instead to use the same 990cc V5 engine that was powering the RC211V’s of Max Biaggi, Sete Gibernau, Alex Barros and Nicky Hayden. The Hondas of that era were making around 240-250bhp and the Proton is probably weighing in at around 140-150kg. Plenty of performance for the fast group at a Cadwell Park trackday then..
There’s no price listed but including spares we’re guessing it’ll cost way into six figures. If you do end up buying it please call us so we can have a go. Cheers.